Manga are Japanese comic books, and kissa are tea houses, so a manga kissa is a kind of private library: you pay by the hour to sit and read comic books, while having the option of indulging in various refreshments. Once you’re past reception, you enter an oasis of calm, in contrast to the frenetic activity outside – a safe space to indulge in a bit of quiet relaxation. On entry you’ll be assigned to a booth equipped with a big comfy chair. 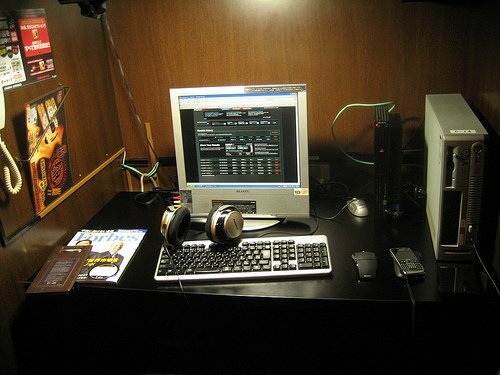 Nowadays internet is always available too, so each booth is also equipped with it’s own computer, and sometimes also a DVD player and games console. Customers browse among the shelves and shelves of comic books, or sit quietly engrossed in the fantasy world of their chosen comic. You’re not likely to understand too much if you don’t speak Japanese, but it’s worth a browse just to see the variety of pictorial literature on offer. 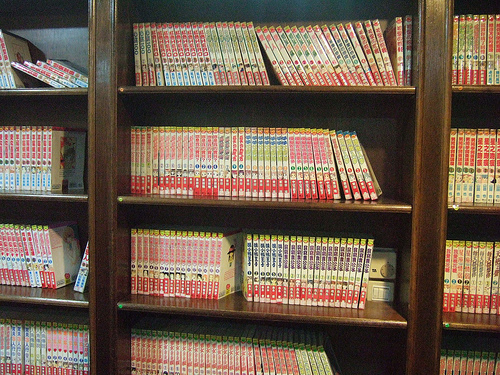 In Japan, manga is very much a mainstream media, so you will find a wide range of genres, from romances to science fiction, aimed at men and women of all ages, very few of which are ever translated or exported. Now that’s all very well, but you may be wondering why I’ve included manga kissa in a list of places to stay. Well, it’s not simply that they’re open all night, but because many also have the option of private cubicles – which are often used as makeshift hotel rooms. There’s no bed, but you can get a reasonable night’s sleep on the chair, or there’s usually just about enough room to stretch out on the floor. This sign says that there’s a Gera Gera manga kissa on the 5th and 6th floors of the building, that it’s open 24 hours, has 20,000 books as well as internet, and that it's OK to take your own food and drink. Being illiterate will be a novel experience for most visitors to Japan The partition walls don’t stretch all the way to the ceiling, but they still afford a reasonable degree of privacy, and blankets and pillows are often provided. 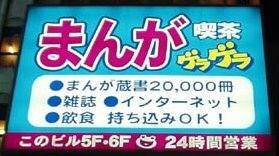 So popular have manga kissa become as unofficial hotels, that they’ve started to introduce showers, and due to the high cost of rental accommodation in major cities, many young people now live in them full time. I wouldn’t recommend an extended stay, but for one or two nights they give an interesting insight into the lifestyles of a section of Japanese youth. Drinks are usually including in the entry price, and are available on a self-service basis, while food options are usually limited to a selection of vending machines offering sandwiches, pot noodles and ice cream. From about ¥1,000 per night (or more accurately a 6 hour period – you’ll have to pay more if you want to stay longer), this could be the cheapest night’s sleep to be had anywhere in Japan. Gera Gera and Manboo, are two of the biggest chains, each having about 50 Manga Kissa spread around the country, plus there are many smaller operators. Buy direct from Japan at Takaski.com. Find the best way to get anywhere in Japan with Train Route Finder. Make your own free Japan E-postcards using Japan.CustomCards.biz. Hear Japanese migrants’ life stories at Japanese on the Move.